This new exhibition considers how the cultures of North, Central, and South America expressed power, spirituality, and identity by decorating and venerating the head. These 20 objects, spanning more than 2,500 years, include intricate ceramics, bold figures, and finely crafted vessels that exemplify how the heads of ancestors were commemorated. Many depict shamans in elaborate headdresses along with figures from every day life. 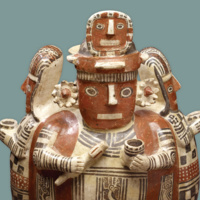 This one-gallery exhibition highlights cultures including the Wari and Nasca of Peru, the Olmec of Mexico, and the Jama-Coaque of Equador. Many of the works were part of John G. Bourne’s generous gift to the Walters’ collection. Crowning Glory is the first of two thematic exhibitions leading up to a new major installation of the Walters’ collection of Art of the Americas. The next exhibition Transformation: Art of the Americas will open in late 2018.